Enjoy the benefits of improved focus and energetic workouts with the new Limitless Inspire Pre Workout formula. 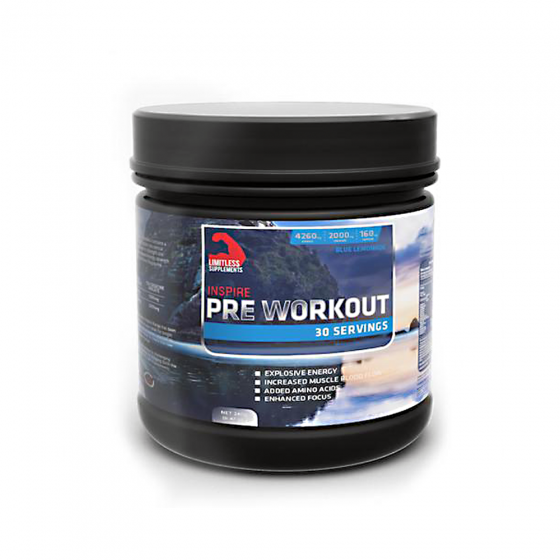 Designed with a combination of scientifically formulated ingredients to increase energy output and stimulate your central nervous system, Inspire Pre Workout gives you the ability to train harder and stay focused for longer. Increase your strength and endurance for a powerful workout every time. Available in Two delicious flavours, Fruit Punch and Blue Lemonade – Try it today!